What is an Eco Friendly Plumber? We are! For years, we at Ocean Plumbing have collected and saved these items for recycling - when we could have dumped them and got on with making more business. Our thinking is it would have been easier to dump them as Recycling takes extra effort. We expend that effort to save and recycle because we love nature and imitate mans Creator, who is the Sole Expert on Recycling. The "Good Book" says, "He hates those willingly ruining his earth." So, we all should do more to be eco friendly... and recycle, as good citizens of the earth. Its for our own good! And, we are trained by taking State Approved Eco Classes covering every aspect of eco safe and friendly plumbing. This also takes time and expense - but is good for all concerned. And, we take classes by plumbing manufacturers and suppliers and are the areas experts in water-conserving faucets, showers, toilets, and septic systems - both new, and updated when repairs are made for you. You don't need to ask for it - its what we do for you! We also service and treat our trucks and equipment with a specific brand of vehicle and equipment anti-wear additives to stop fuel waste, dirty exhaust, and prevent leaks of oil, antifreeze, and hydraulic fluids. This prevents ground water contamination on our part. Its a bit costly, but check our trucks and equipment, and the way we work compared to other plumbing companies who tend to ignore such care of their work ethics, and trucks and equipment. Ours are clean and drip free. We do it right so we can sleep at night - and so can you. Thanks for your business. Call us, Ocean Plumbing, YOUR Eco Friendly Plumber to do your new remodel repair emergency home or business plumbing. Call us for a FREE Estimates. Call 361-937-7284. Thanks for your business. Ocean Plumbing. Eco Friendly Plumber. Yes! This means, we, at Ocean Plumbing, are trained as "Eco-Friendly plumbers," using the best State-Approved, "Green" Plumbing Products, and Techniques. "Ocean Plumbing does it right so we both can sleep at night." Have an Emergency? We can be there in about 60 minutes, in town, a bit later out of town. For a bid, estimate, or any type plumbing help! Call us now! Talk directly to a plumber. You get an "Eco-Friendly and Green" plumbing expert, fair prices, and the work done to more than your satisfaction. We promise! Call us now! 1-361-937-7284 James Christ. 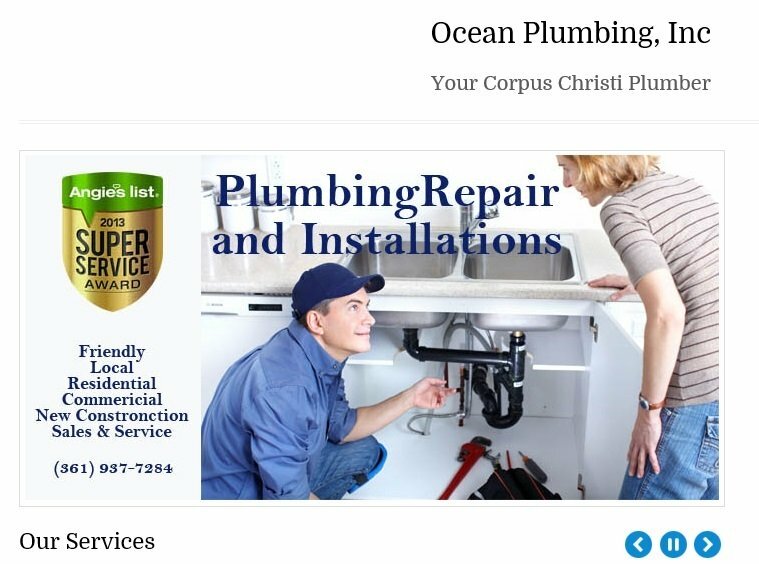 Your local, Corpus area Master Plumber. Owner: Ocean Plumbing. Listed on the City of Corpus Christi, Texas. City Inspection Department Office. We appreciate the opportunity to fix and service your plumbing need.